Poez began performing in the street because in the 60s and 70s street performing was respected all over the world as a choice for serious artists, that offered its own advantages, in terms of audience, setting, and, especially, absolute freedom and control over the work. At the same time, it could pay better than many performers go home with after performing in a theater or club. Plus, in the mid-70s when Poez was starting out, traditional poetry venues were downright hostile to what he was doing. Real poets, they felt (many still do), read their work from the page. They don’t need to show off by memorizing and acting out. Today, street performing has lost the respect it once enjoyed, at least in the U.S. But it is still a nice, risky way of reaching real people with absolute freedom. For poetry, a city street can be the ultimate theater. The heart of Poez’s street act has always been his Poetry Menu. 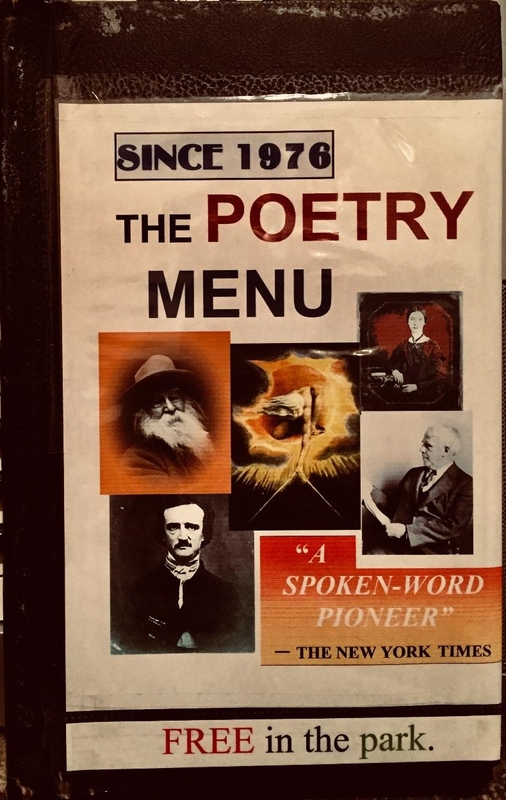 It promises a live, dramatic performance, on the spot, of the customer’s selection from a list of classic and original poetry, from memory. The recordings below are a selection from the Poetry Menu. Click on any title to hear it performed.